ASDA WalmartOne UK Login and Help. Access the ASDA Walmart One UK website to view your ASDA shift schedule, book your holiday or learn about your ASDA Colleagues employee discounts and benefits. If you are accessing the ASDA Walmartone employee portal for the first time, then please be aware that the official ASDA Walmartone UK website is slightly different from the official Walmartone website used in the U.S.A. The UK Walmartone startpage can be found at https://Asda.walmartone.com. The U.S.A Walmartone startpage is located at https://www.walmartone.com. The UK Asda Walmartone employee portal is packed with ASDA UK related news, whereas Walmartone US will update you on company news related to Walmart USA. The official ASDA Walmartone news page is at Asda.walmartone.com. Click on “Sign In” to log in. How do I log in to my ASDA Walmartone account in the UK? However, both the UK and US websites will eventually lead you to the SAME login page, which can be found here. To log in to either, you will need to enter your WalmartOne User ID and password. Please be aware that you need to register for a Walmartone account before you can access the employee portal. To register for an ASDA Walmartone account, navigate to https://apps.walmartone.com/walmartone/intro.do. You will asked to enter your Walmart/ASDA Identification Number (WIN), your birthday, date of hire and your email address. Your Walmart (ASDA) Identification Number is the employee number that was assigned to you, when you started to work for ASDA. If you don’t know your WIN number, then ask your supervisor or look at your paycheck. Forgotten ASDA Walmartone UK Password. I have forgotten my ASDA Walmart One password. How do I recover it? If you are a current ASDA Collegue and you have forgotten or lost your ASDA WalmartOne UK password, then go here for password recovery. You will still have to know your WalmartOne User ID to recover your password. If you have forgotten both, then contact ASDA Human Resources. Forgotten ASDA Walmartone UK User ID/Username. I have forgotten my ASDA Walmart One username. How do I recover it? 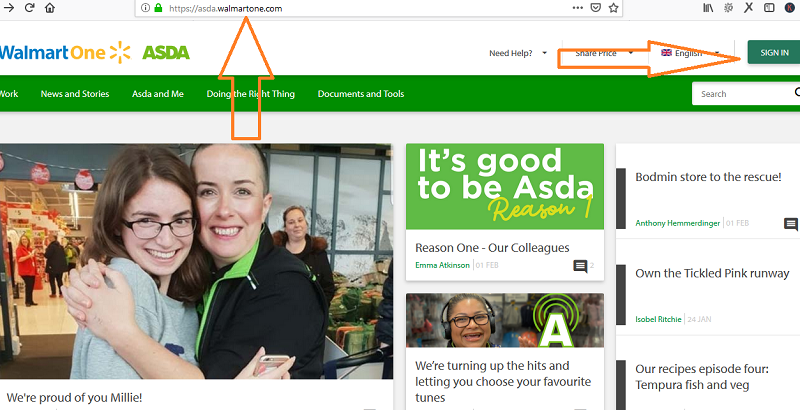 If you are a current ASDA employee and you have forgotten your ASDA Walmartone User ID, then navigate to this link, type in your email address, and fill out the CAPTCHA. The email address that you used when you registered your Walmartone account. Click on “Go”, follow the instructions, and your ASDA WalmartOne User ID will be emailed to your email address on file. Does ASDA employees get a discount in ASDA and Walmart stores? Yes, Asda employees get a 10% discount on most store purchases throughout the year. At Christmas Asda employees get a 20% discount on Christmas food, alcohol and electric items. Excluded are petrol and cigarettes. You will be eligible for the 10% discount after a 12 week probation period, after which employees will receive an ASDA discount card. Can I use my ASDA Employee Discount Card online? Yes, simply add items to cart, and go to checkout. Complete the billing address and payment details and select ‘pay with an evoucher’. Then use the code “ASDA”. The system will ask for your Walmart number and then your discount card number. A message will say that the 10% discount has been applied. Working at ASDA gives you a whole range of benefits, discounts and deals. The ASDA Benefits website is a separate entity from the WalmarOne website and can be found here. Enter your 10-digit Walmart number and password to log in to the benefits portal. The ASDA Green Room was the ASDA colleague website, and was found at www.asda.com/greenroom. The page was available to anyone, Asda colleague or not. However, the page has been removed, and ASDA colleagues should go straight to Asda.Walmartone.com to learn about company news. If you have online access then you can visit the ASDA.WalmartOne.com Colleagues Support page, for answers to frequently asked questions about the ASDA.Walmartone.com Colleagues website. If you have need to know your WalmartOne Identity Number (WIN number), are experiencing login problems, or have a question about how to book your holidays, then you should call the ASDA WalmartOne HR Shared Services on phone number: +44 0113 2919000. If you are experiencing any technical login issues (if you are getting an ERROR message), then you should call the ASDA UK ISD Service Desk on phone number: +44 0113 8261262 (Internal: #6123 – Option 2). Share your experiences with the ASDA Walmartone website, by leaving a comment in the comment section below. 1 ASDA WalmartOne UK Login and Help. 3 ASDA Walmartone UK Login. 4 Forgotten ASDA Walmartone UK Password. 5 Forgotten ASDA Walmartone UK User ID/Username. 6 The ASDA Employee Discount. 9 ASDA WalmartOne HR Contacts.